Brewhouse Margaret River can fly a little under the radar in the craft beer world, but that isn't to say they're not holding their own against the other brewers in the South West of WA; their on premise sales are significant and they've done a great job in capturing the family market in a region drowning in boutique wineries. The quality and consistency of their core range suggests they've got their brewhouse dialled in, but their limited release beers tell us that head brewer Ryan Ashworth has plenty of ideas to keep things exciting. 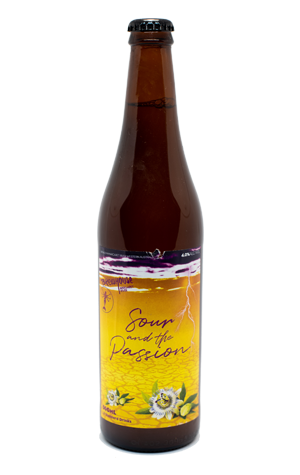 Sour and the Passion is a one-off arriving for the start of spring 2019. The name is clearly a riff on a particular Aussie pub rock band, but there's nothing funny about this beer, which comes with an enamel-shredding sourness derived from a combination of kettle souring, a clean and light base beer, and a post-fermentation dose of organic passionfruit pulp. An array of American hops round out the 4 percent ABV brew and pump up the fruitiness for maximum flavour. Seriously refreshing and thirst-busting stuff.